Please don’t get us wrong, we love you Mr. Bachchan. Over the years, we have put our one hand inside our pant’s pocket and the other out; mimicking you and your voice. But Shamitabh, oh well! It was only your voice sir, just yours, throughout the film! That’s something we couldn’t take for long. Sorry. The story of the film is quite innovative and comes with a breath of fresh air. Danish (Dhanush), is a deaf and mute guy who is smitten by Bollywood since his childhood. His passion to pursue his dream; brings him to the city of dreams. Here the kind-hearted Akshara (Akshara Hassan), an assistant director, notices his raw talent and confidence. She tries to help him in his struggle, but fails. With the help of her doctor father’s advice, she sends him abroad where they manage to make Dhanish speak. When he is back, the hunt for his voice begins. They zero in on Amitabh Sinha (Amitabh Bachchan), who has the perfect voice. Amitabh was once an aspiring actor himself, but his voice knocked him out of every role; so now he lives in a cemetery and is fiercely alcoholic. Their names are clubbed together and Danish is named Shamitabh. His first film is a big success and he becomes a star overnight. This gives a rise to severe ego clashes between them, as Amitabh feels it his voice that brought the mediocre Danish to stardom. They fall apart and things get over complicated. So will they leave their differences and get back together? If yes, then how? These questions are answered in the climax of the film. The story, like we said, is refreshing. The problem is the screenplay. It’s absolutely loose and has a lot of loopholes. It doesn’t manage to keep the audience involved in the process for a long time. Also, why Amitabh is so egoistic, is not fully explored or justified. Because of this, most the arguments in the film do not make sense and don’t generate the kind of effect the writers must have aimed for. 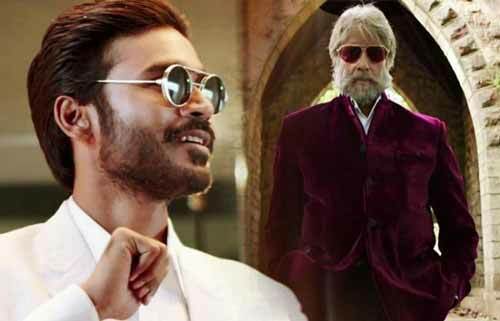 Also, since Dhanush’s character is deaf and mute, we only hear Amitabh Bachchan delivering dialogues. They are long, boring and tiring lines that literally draw us away from him and whatever it is that he is trying to say. The performances are splendid. Mr. Bachchan is magic on screen as usual, but the poor screenplay lets him down. Dhanush is wow! This man is the latest, most talented powerhouse of talent in the industry. Watch out people! Unfortunately, since he doesn’t have anything to say; there is only so much he can do in the film to make his presence felt. Akshara Hassan is fresh and good. She just carries a tad of a south- Indian accent in her speech and needs to get rid of that immediately. The first of the film is quite well executed though and has some genuine moments of laughter and emotions. But, the second half is a big YAWN. The music of the film is decent and a few songs are hummable. They do not make it to the super hit list though. All in all, after interesting films like Cheeni Kum and Paa, this could have been R. Balki’s hat-trick, Alas! Our Verdict: Watch it only if you are a crazy Amitabh Bachchan fan.